Developing the fastest page builder for WordPress is not a simple task. There are two main ways in which the speed of a page builder is measured: how fast it is to design with, and how fast the pages it creates load. Elementor has been the right choice of page builder in terms of speed and performance since its launch, and now we are helping it even further lead the way as the fastest page builder for WordPress. Back in July, we improved on the first type of speed. We added code improvement that affected the speed of the editor itself, and increased its speed by 30%. Now, we have managed to improve upon how the pages that have been created by Elementor, load, by changing the way Elementor styles are saved. 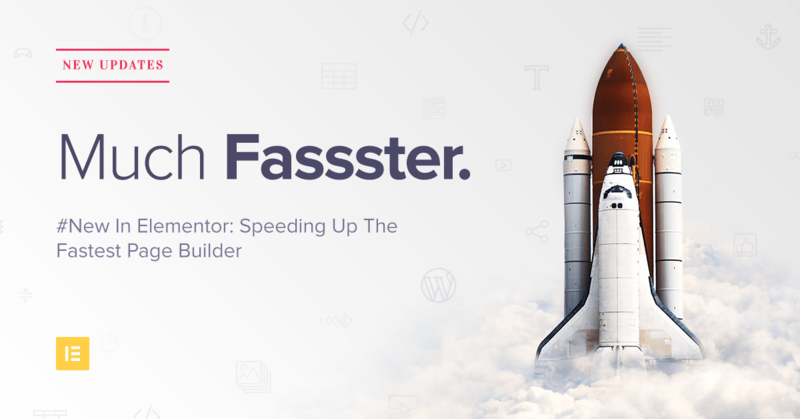 How We Made the Fastest Page Builder Even Faster? Our latest update insures that all CSS generated by Elementor is saved to external minified CSS files, and not on the HTML of the page. This drastically shortens the final source code of the page, because all styling is saved externally. A lot of factors go into determining how fast your pages load, like which hosting provider you are using (great post on that subject recently appeared on WPKube). If you’re an SEO oriented person like myself, you are probably familiar with the line “Leverage browser caching”, that appears on the various page speed testing tools. This commonly appears as one of the points that could use optimization. By saving Elementor styles on external CSS files, we are able to properly leverage browser caching, and consequently improve page load speed. This way the code stays nice and clean, and the page loads faster than before. This has an impact on the SEO of the page, so you can expect a higher Page Speed score. Exclusive PreDesign Pages – Unique template sets to choose from for homepage, contact, services, and more. 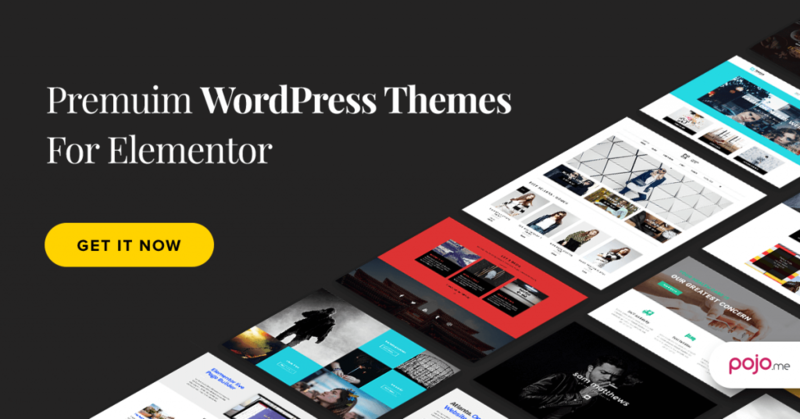 Exclusive Elementor Widgets – Embed the theme’s handy widgets right in Elementor. These include a forms widget, galleries widget, slider widget and post carousel widget. Built entirely with Elementor – Because all themes were built completely with Elementor, it gives you much more flexibility when changing any aspect of the site. 100+ Customizer Settings – We’ve supercharged the customizer to its maximum capability, letting you control every aspect of the site, right from the customizer. Check out the full list of themes & features in the Pojo website. Back on the same subject of CSS manipulation. 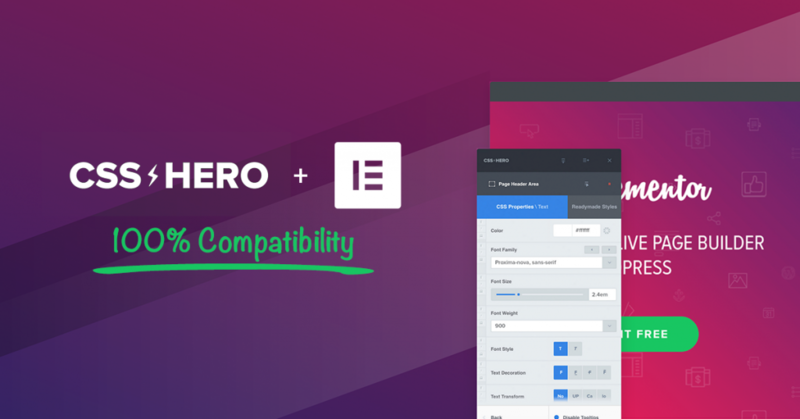 Recently, CSS Hero tested its compatibility with Elementor. I am glad to say we got a whopping 100% score of compatibility. This is definitely going up on my parents fridge! But seriously, This is a great plugin that lets you delve deep in the CSS of any element and make live changes. You can choose any widget, column or section within Elementor, and start working on its classes and IDs. Check out their test drive area for Elementor. We consider you guys, the Elementor users, as part of our team of development. This is because you hold the vital role of telling us what needs tweaking, what you most need us to add, and how we can go and improve our page builder. 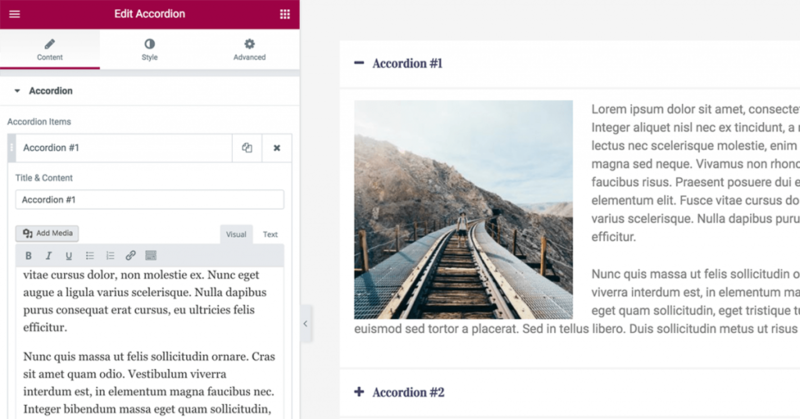 In this week’s release, we are adding a feature that has been requested time and time again – the ability to add any type of content to Tabs, Accordion and Toggle widgets. We’ve actually added the TinyMCE editor to these widgets, so you can fill them with images, text, shortcodes and any content you wish. This update is a great help for bloggers. Adding the TinyMCE editor is not the only change we have made. The Elementor panel can now be expanded to a wider range than before. In addition, we have removed some unnecessary TinyMCE buttons, and have made the default width of the panel wider for larger screens. All these changes were done to make it easier for you to use Elementor when writing your content for your site’s pages and posts. Oh, and one more thing... ELEMENTOR PRO HAS A LAUNCH DATE! Guys! This is what we have been waiting for all these months. We’ve worked really hard to create a Pro package that has enough benefits, that it will convince you to take the extra step and upgrade. We’ll be finally releasing our Pro version of Elementor on the 12th of December. Elementor will always remain free, that’s our vision, and we’ll be adding more features to the free version as well, so don’t worry, you’re covered either way. Prior to the launch date, on the 25th of November (AKA Black Friday), We are going to launch a BlackFriday pre-order, giving you a chance to enjoy 50% off the marked price of Elementor Pro. That’s a huge discount, and it’s only for 72 hours, so be sure to set your calender. It’s going to give you a lot more control over your website. Stay tuned for more updates on this subject. You’ll be amazed with Elementor Pro. It’s the best possible design solution for designers, developers and anyone using WordPress. OMG, Ben, Elementor has finally been thrust into the forefront of WP page builder with this update! One can now use the Insert Pages plugin to insert Elementor created content anywhere that one can use a shortcode!!!! Wow, this look a fantastic news Lyle. Is this feature included in the free version or will require the PRO one? Yes, this is in our roadmap. Ben Pines, with launch of Elementor Pro the Free version will be discontinued? It will always be free, and we’ll be adding more features to the free version as well. Next week, when we start the pre-order, you’ll get all the details. The price for PRO will be for a lifetime license, or for a yearly subscription? Is there any form of price yet for the pro or do we have to wait a bit longer? great news! any pricing plan for the pro already? By they way love Elementor its a awesome system wont use anything else from now on. You just have to upgrade to the latest version and it does everything by itself. Thanks! Hey Ben, will the PRO version be one-time-payment or per-month-payment? Cheers, awesome job in the plugin! Yes, it will work the same. Bravo por el nuevo Elementor. Damn. This is great to hear. I can’t even believe how amazing it is to use Elementor. Really hoping to take advantage of launch. But if I’m still broke, I will eventually get it. It’s been such a good help I must support. Well… the last update… which was today is a disappointing one. On my front page (landing page) I was using the carousel element which after upgrade displayed all my images into a single column from top of the page waaay down to the footer… and on other page I was using the tabbed element which after the update didn’t work at all. So i had to return to previous version in order to offer my clients/visitors/customers the possibility to use and browse the website’s pages. Incredible! Looking forward to the Pro details as well. Hoping for a white label option as well as the option to replace / modify the core templates specifically for niche sites. We won’t be having a white label option. Nice work guys. It is an amazing Builder! What will be included in the Pro version?? This will be explained next week prior to Black Friday. Hi Ben, had been testing Elementor for a while and really love what it does. Totally over delivered for a free plugin. Can’t wait for the Pro version. Just wanted to know if you can work out a bundled deal with CSS Here during your launch! 🙂 That will be awesome. Great work – looking forward to seeing the pro offering. Just one clarification: does the pro release mean the Developer API will finally be ready so we can make our own widgets? Yes. Will be released shortly after the launch. So no other (more expensive) lifetime option, not even for early adopter? I think an yearly subscription is fair, I know developers need a sustainable business, but I really hope for a one-time-payment option for people who want support you but are not very comfortable being tied to a yearly renew. Anyway, thanks for your work! Nice Plugin, I only wish you add language translation .pot file to make faster translation in other language than the online translator of wordpress. That’s too bad and I hope you reconsider. Renaming plugins with generic names and colors helps when selling to a niche. Plus it’s a feature worth paying for… fingers crossed. Alex I suggest you post specific features you would like to see that can touch the outskirts of white labeling options to the Github repo: https://github.com/pojome/elementor Try and broaden the feature the best you can. As it can create some discussion on Github. Give some case samples on how you hope to see it used. Would pro version included in your themes? Do you have any discount on themes? I have tried several times to resolve this issue can you help? Elementor was fine and I built an entire website – Now I’m denied access with this: The content area was not found -you must call the_content’ function on the current template. A code is suggested-but no direction on there to put it? The guys and gals at support @ elementor.com are great at answering your support concerns. I made a search for the_content’ function on the current template elementor. One thing that came up was that certain plugins might affect the site when Elementor is used. Through FTP go to the plugins folder and rename it to 1plugins to deactivate all the plugins. Then login (hopefully you will be able to login). Then rename the 1plugins back to just plugins. Then activate one plugin at a time. Begin with the plugins you are most sure of. Log out and then back in again. Then continue with one plugin at a time. Log out and in again. Hopefully you will figure out which plugin is affecting the site. If it is a plugin then contact the developer and let them know about the problem you had with their plugin and that your using the Elementor plugin to design your site. Will be a role editor function in Elementor (like in DIVI)? It will be nice to restrict Editors permission to edit only content of blocks and not to modify other settings. Hi Ben, very nice work. Will the pro version have extended licensing? Can it be bundled in theme for resale? eg. ThemeForest Themes? A lot of theme authors will be interested in using this builder but would need access to create their own widgets for use in their themes. Cheers! No. You can use the free Elementor plugin. Thank you. Can you also tell me if the API will be included in the free and paid versions? Cheers! It will be, both for free and paid. Fantastic. Thank you. Very excited about this builder. Is Elementor Pro going to have an affiliate program? tomorrow there will a pre-sale offer? Are you going to publish it here in the blog? or where? An affiliate program is not yet available. Pre-sale up later today. Just pre ordered. (Y) I have not received any order confirmation could you please let me know how to contact support? Can you possibly check your spam box? Nada, no emails. Can’t even access the purchase page where I had my license key 🙁 I have only received paypal email. I want to buy “Elementor Pro – Finally Revealed! Pre-Order for 50% Off “, unlimited plugin. My only concern is whether I can create/code my own elements, For eg: if I want to have masonary grid with custom changes or have cpt like recent projects slider. I am aware I can create widgets but I would want to avoid them and create elements like Visual Composer. Is that possible. Yes. We have an API and we will publish the guide how to use it following the launch. Speeeeeeeeed!!! With Google wanting page load times under 3 seconds, we desperately need speed. After much optimization effort GTMetrix is still showing a couple duplicate css files. Also having difficulty combining and minifying css & js, plus don’t want Google fonts and do want to use sprites to reduce server calls and make the pages load faster. I’m finishing up a fairly simple site with a home page that’s 1.35MB on WPEngine (which is about as quick as a host can get) and even with cache and minification enabled, no 3rd party chat or social media tools to slow it down other than a single embedded YouTube video and Google Analytics, the home page is still taking between 4 and 5.5 seconds to load. Goal is to crank out a website quickly and run it through page speed analysis tools and return excellent scores to the clients. Regardless of what the site’s rankings turn out to be, at least the high scores will show strong due diligence in the theme and optimization decisions. Wow! I love Elementor page builder.